What you eat during pregnancy is crucial. The embryo is completely dependent on the availability and supply of nutrients provided by the mother. The quality of these nutrients – helpful or harmful – is determined entirely by her nutrient stores and eating patterns. With that in mind, the frequent question “What can’t you eat when pregnant?” becomes all the more important. 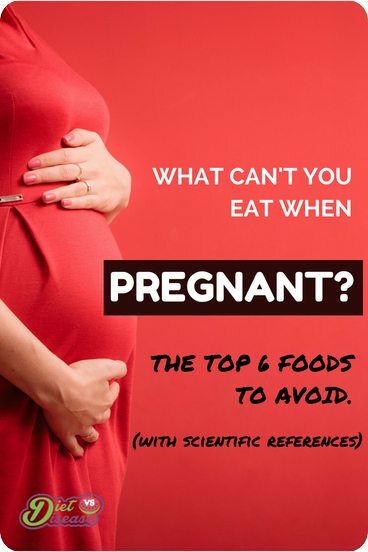 So here are the top 6 foods to avoid when pregnant, supported by current research. INFOGRAPHIC: See the infographic of this article here. Unless otherwise specified by your doctor or dietitian, dietary supplements may not be suitable during pregnancy. Or to be more accurate, they are not worth the risk. Several types of dietary supplements contain super-loaded quantities of abortifacient compounds. An abortifacient is a substance that causes contractions of the uterus wall, inducing abortion. Abortifacients used today are pharmaceutical drugs, such as the Morning After Pill. However, this was not always the case. Foods naturally high in abortifacient compounds were commonly used during the pre-pharmaceutical era. Herbal, ritualistic and spiritual preparations were trusted, although the effectiveness of these has never been confirmed through scientific method (2). While the effects of abortifacient-like food supplements are limited to animal studies and anecdotes (casual observation), it makes sense to avoid varieties known to have abortifacient properties. Take Fenugreek supplements for example, commonly used to improve blood sugar response and even to stimulate lactation for optimal breastfeeding. However, when given to pregnant rats in moderate doses, it is suspected of causing birth defects, particularly related to spinal development (3). It was also shown to have an anti-fertility effect in both male and female rats. Therefore it would be wise to avoid fenugreek supplementation during pregnancy, just to be safe. Juniper Chinensis, Saffron and Ginger are just three of the numerous other plant-foods thought to have abortifacient properties at high doses. Science is lacking across this whole area, however. Just to clarify, not all supplements are harmful. In fact many are safe and beneficial, such as folic acid, Vitamin D and most omega-3 fish oils (4). But if you do take or plan to take a regular supplement during pregnancy, check the ingredients list and then double check with your healthcare professional first. Summary: Several dietary supplements contain abortifacient compounds if taken in large doses. Fenugreek is a prime example and has been shown to cause birth defects in pregnant rats. Many supplements are safe, but always consult your healthcare professional first. Certain species of fish contain large amounts of the mineral mercury. Excessive mercury in the blood during pregnancy has long been linked with both pregnancy complications and developmental problems in infants; particularly brain development. While there is no solid experimental evidence, from what’s available, there certainly appears to be a linear relationship with mercury levels and IQ deficit in children (5, 6). Put another way, IQ scores drop with increased mercury levels. It seems even the potential brain benefits of Omega-3s from fish consumption cannot offset the effects of mercury. As no apparent safe limit can be determined from current data, the safest recommendation for pregnant women is to keep mercury exposure within a low range. Therefore it’s best to avoid shark, tuna, marlin and other predatory fish, either fresh or frozen. They are the largest source of mercury in the human diet by far (7). Non-predatory fish such as salmon, sardines, trout, mackerel, and herring are the safest varieties. They contain far less mercury and are considered safe to eat when pregnant at servings no more than 350 g (12 oz) per week. Fish oil and cod liver oil supplements are also considered safe and are a great way to ensure optimal omega-3 intake. Just be sure to look for labels that confirm the product is low in mercury. Additionally, some argue there are no safety concerns if the amount of selenium in a fish is higher than its mercury content. However, this a very new area of research. There is no evidence for protective effects on long-term mercury exposure, which represents what’s happening in real life (8). Also keep in mind that regional differences in both mercury and selenium concentration must be considered. Species low in mercury (or high in selenium) in one part of the world may not be so in another. So if you must eat fish while pregnant, best stick with non-predatory fish. Summary: Mercury exposure during pregnancy is strongly linked with developmental problems for the infant. Predatory fish such as shark and tuna contain the highest concentrations of mercury in our diet. 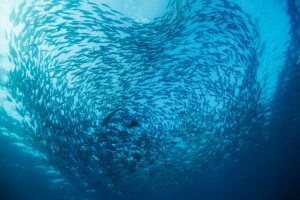 As no safe limit can be made, it makes sense for pregnant women to minimize fish consumption, especially predatory species. Teratogenic is the term used for any compounds and substances that can disrupt the development of an embryo or foetus. Not all teratogens will harm an unborn child, but the ones that do carry the potential to cause serious birth defects. To be safe, complete avoidance of teratogenic substances during pregnancy is strongly recommended. Lithium medications (at certain dosages), used to treat bipolar disorder (9). It is well-established that the offspring of mothers consuming alcohol during pregnancy suffer from developmental delays and behavioural changes. As such, zero alcohol should be consumed throughout the entire pregnancy (10). 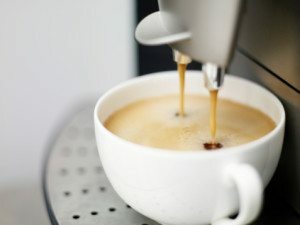 Caffeine is another teratogenic substance that’s not safe in large quantities. It is a psychoactive substance; one that crosses the placenta to the baby. While you may be tolerant to the caffeine in your morning brew, your child is not. Many experts and leading health organisations recommend caffeine intake be limited to less than 200 mg per day if pregnant. This is equal to one 350 ml (12 oz) cup of coffee, and should be safe. And remember that caffeine exists in a variety of different foods including tea, soft drinks and chocolate. Summary: Teratogenic substances can disrupt the development of an unborn child. Common foods sources include alcohol and caffeine. It is recommended all alcohol be avoided, and caffeine intake limited to 200 mg per day. Cow’s milk is a unique source of essential proteins and minerals. That’s the reason physicians and health professionals recommend increased servings during pregnancy. However, a new problem has emerged in recent years of research… One that conventional medicine will be slow to grasp. Cow’s milk is more than just a nutrient for mammals; whether cows or humans. 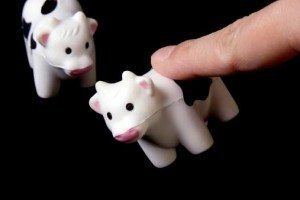 This is because unlike meat and fish, which are structural proteins, cow’s milk is a signalling protein. It activates the nutrient-sensitive protein complex mTORC1, a key regulator of cell growth, formation and metabolic programming. Overstimulation of mTORC1 is strongly linked to numerous health problems throughout a human’s lifecycle, including obesity and even cancer (11, 12, 13). A high milk consumption when pregnant is strongly associated with increased foetus growth and birth weight (known medically as Macrosomia). This is likely caused by the over-stimulation of mTORC1 in the foetus. 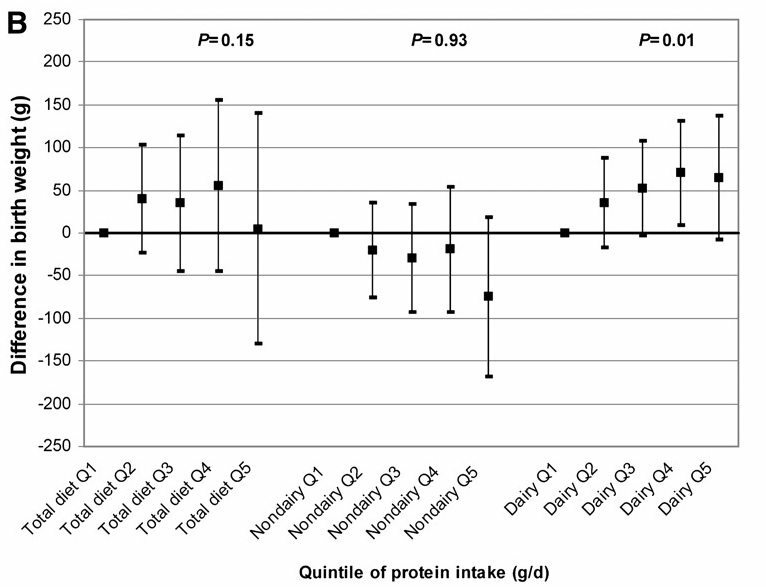 The figure below illustrates the average difference in birthweight of offspring from mothers with a protein intake ranging from very low (Q1) to very high (Q5). It suggests higher dairy protein intake leads to higher birthweight, and is the only type that reaches statistical significance (shows this result was not by chance) (15). Associations of maternal protein intake with offspring birth weight: the Generation R Study, Rotterdam, Netherlands. Macrosomic infants appear more likely to be obese in childhood and adulthood, which inherently increases their risk of cardiovascular and metabolic problems later in life (16, 17). It’s well accepted that dairy is problematic and inappropriate for children less than twelve months old, and that cow’s milk-based infant formulas provide excessive nutrients and growth hormones compared to breast-milk (18, 19). It only makes sense then that large amounts of dairy during pregnancy may not be beneficial for the baby. At the end of the day, when you can get adequate nutrition (including calcium) from leafy vegetables, eggs and other food sources proven to be beneficial and safe, there is no need to consume large quantities of dairy anyway. Summary: Cow’s milk is a signalling protein that promotes excessive cell growth and formation. Consumption during pregnancy is strongly associated with large birth weight, which increases risk of obesity and metabolic disorders for the child later in life. Raw or undercooked animal products have the potential to foster harmful bacteria. The most common types of bacterial infection include Salmonella and Listeria. They have the ability to cross the placenta and harm the baby, which can be life-threatening. 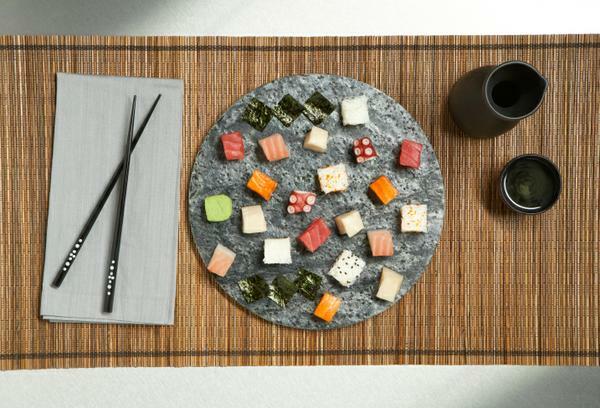 Uncooked food such as raw sushi, raw eggs, and unpasteurised milk should be completely avoided. Refrigerated, ready-to-eat animal products such as deli (cold pressed) meats, soft and semi-soft cheeses, and even soft-serve ice cream are also potential sources of harmful bacteria. The risk of exposure from these products is actually extremely low, but the risk exists nevertheless (20). If you do decide to continue eating soft cheese or deli meat during pregnancy, choose the freshest foods (close to manufacture date), eat them by the next day at the latest, and ensure the food is consistently stored below 4°C (39°F). Summary: Raw and undercooked animal foods contain potentially harmful bacteria and should be avoided. Ready-to-eat animal products such as deli meats and soft cheeses can also contain unsafe bacteria, but the risk is extremely low. During and immediately after pregnancy, it is clear added sugar is hazardous to health. Perhaps even “toxic”, as sugar is so often labelled in today’s media. Excessive sugar in the diet leads to insulin resistance and pre-diabetes, otherwise known as Glucose Intolerance. The risk of glucose intolerance is far greater during pregnancy, as insulin function naturally declines (insulin is the hormone that removes sugar from the bloodstream) (21). Less working insulin means more sugar “stuck” in your bloodstream. For this reason, it’s crucial to minimise or even completely avoid foods high in added sugar. A glucose intolerance identified during pregnancy is known as Gestational Diabetes. 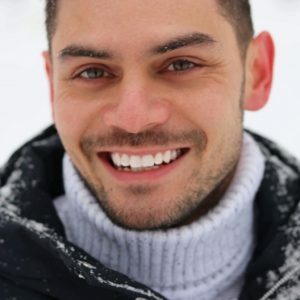 Children born to mothers with any form of maternal diabetes have a greater risk of becoming obese or developing type 2 diabetes compared to children born to diabetic fathers (22). This is because sugar ingested by the mother can cross the placenta to the foetus, while insulin (which removes sugar) cannot cross. As a result the foetus must increase its own insulin secretion to metabolise the sugar (23, 24). Increased insulin secretion is an important growth factor for a developing foetus. It can lead to excessive growth and large birth weight, which is not ideal (22). The extent of your child’s weight gain in the first year becomes a factor for insulin resistance. It is not a factor for children born to mothers without gestational diabetes (25). Women with gestational diabetes in their first pregnancy have a 41% increased risk for recurrence in their second, as well as an increased risk of type 2 diabetes later in life (26). Additionally, every extra 4.5 kg (10 lb) gained after pregnancy is associated with a twofold increase in type 2 diabetes risk (27). All the more reason to eliminate unnecessary calories, such as added sugar, from your diet. Summary: High amounts of added sugar during pregnancy promotes excessive weight gain and Gestational Diabetes. This can lead to a host of serious health problems for both mother and child later in life. There are many foods necessary for a healthy pregnancy. 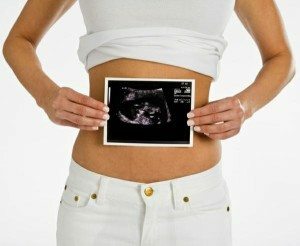 Women with a pre-pregnancy BMI of 18.5-24.9 kg/m2: total weight gain should be between 11-16 kg / 25-35 lbs. Women with a pre-pregnancy BMI of 25.0-29.9 kg/m2: total weight gain should be between 7-11 kg / 15-25 lbs. That works out to be only 250-300 additional calories per day… equal to just one boiled egg plus a handful of almonds. Eating for two certainly doesn’t mean you should eat twice as much… But it does mean you should be twice as careful. By understanding what foods to avoid, and what portions are safe, you are gifting your child the best start possible. The Morning After Pill (aka Plan B) is not an abortifacient. Pregnancy is defined as an embryo which has implanted into the uterus (although the embryo can incorrectly implant in other places such as the fallopian tube where the pregnancy is unlikely to progress very far without risking the life of the mother & embryo). The Morning After Pill prevents implantation, which means that no pregnancy existed at the time the pill was taken. Once implantation (pregnancy) occurs, the Morning After Pill will NOT work. A true example of an abortifacient (something that ends an ACTUAL pregnancy) would be Mifepristone (also known as the abortion pill, RU 486, Mifegyn, Mifeprex), and Misoprostol (also known as Cytotec, Arthrotec, Oxaprost, Cyprostol, Mibetec, Prostokos or Misotrol). individual). There should certainly be warning and clarification that it does not prevent conception bit rather, prevents implantstion of a fertilized egg. this is important to many and many have felt duped by this. Rightly so. it is an issue of INFORMED CONSENT. I have the two mutations listed in the beginning of your article. I am 76 now and I have had anxiety all my life, hypothyroidism(as well as my daughter), celiac disease, TB ( ate a perfect diet, but could not absorb nutrients due to celiac that was not diagnosed til I was 62 yrs old), also chronic fatigue immune difficiency, fibromyalgia,surgery for cervical stenosis, (again for poor absorption of nutrients due to celiac disease), and now inability to throw off the toxins from mold exposure and thus mold illness. And by the way, my daughter has had three miscarriages, has hypothyroid, and had surgery for cancer,and all three of her daughters have neurological issues. So it seems that all or most of the suppositions about MTHFR came to fruition in our family…more to come perhaps as time goes on. Thank you for your article. I was tested for MTHFR about two years ago. Wow, I’m only 3 weeks with no children. 35 years old. Had ectopic pregnancy this time last yr. I almost bled to death not knowing I was pregnant. I want to make sure I’m doing everything perfect this time. Great article! Anything more u can post to enlightenment, please do so! I have anxieties/depression and take lexapro. I tried to get off for my pregnancy but I couldn’t manage my life. I have a friend that took this drug while pregnant and her child has autism. Her other two older children she wasn’t prescribed this drug and they r fine. Needless to say, I’m scared shish-less! Please pray for my pregnancy! How true is it that horseradish helps in lactation? Thanks in advance and great guide, by the way!